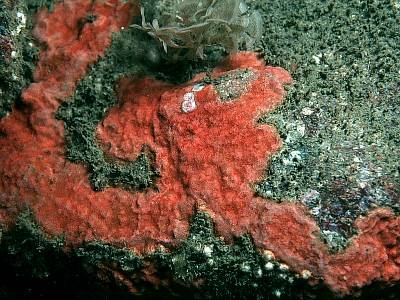 Description: This red encrusting bryozoan forms extensive patches on bedrock and boulders. It has a slightly bumpy or rough surface but consists of a single layer of zooids. Habitat: Found in sand-scoured circalittoral habitats on bedrock and boulders. Distribution: This appears to be a southern species in the British Isles, only being known from the south-eastern corner of Ireland and the Channel Isles. As it is a recently described species it may be more widespread. Similar Species: This is the only bryozoan within the area known to form such extensive bright red patches in the sublittoral zone. Extensive red patches typically 50mm or more in size. Slightly bumpy surface with zooids visible at the edges. Picton, B.E. & Morrow, C.C. (2016). Schizomavella sarniensis Hayward & Thorpe, 1995. [In] Encyclopedia of Marine Life of Britain and Ireland.